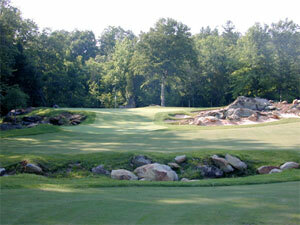 Tot Hill Farm Golf Club is another thrilling design by famed golf course architect Mike Strantz. The moment you arrive on the first tee your heart will race with anticipation. The experience is guaranteed to be one of the most exhilarating rounds you’ll ever play. Most of the holes are bordered by beautiful rock formations and meander through thick forested terrain. The golf course demands a player to think his or her way around the property. Negotiating the winding fairways and the undulating greens makes for one of the most challenging rounds of golf, not only in North Carolina, but in the entire country.